Minnesota research demonstrates the tourism economic value of scenery and scenic routes, says Max Ashburn of Scenic America. For more such studies, go to Scenic America. A recent study by the University of Minnesota Tourism Center found that the Paul Bunyan Scenic Byway is a major draw for travelers and has a significant positive impact on the local economy. The study found that in 2010 an estimated 23,800 travel parties visited the region specifically because of the byway. These visitors spent a total of $21.6 million dollars while in the area including $14.6 million on locally produced goods and services. 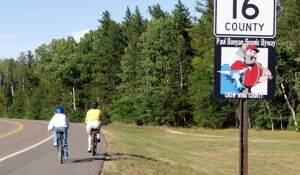 Of course, Scenic Byways do more than just contribute to the local economy. They also help preserve and promote the natural, historic and scenic character of a region and are a source of pride for local residents and businesses. 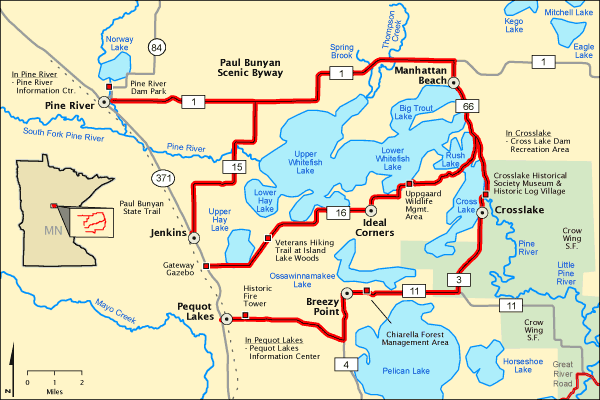 The Paul Bunyan Scenic Byway is one of 150 designated roads in the National Scenic Byways Program administered by the U.S. Department of Transportation. This entry was posted in Findings, Resources, Stewardship and tagged aesthetics, findings, Minnesota by Jonathan Tourtellot. Bookmark the permalink.